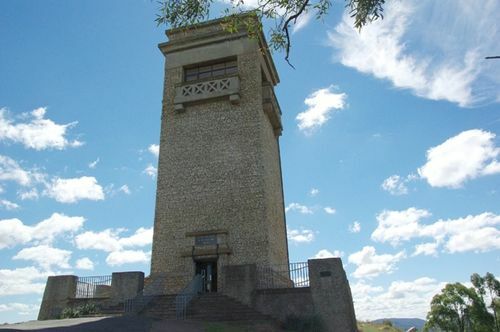 Tower built by public subscription to commemorate those from the Goulburn district who served in World War One. Inside the tower is a tablet inscribed with the names of those who enlisted from this district. The foundation stone was laid on the 25th April 1924 and the memorial was unveiled by the Governor on the 15th December 1925. His Excellency Sir Dudley de Chair will unveil the soldiers' memorial at Goulburn on Tuesday next. The memorial has been erected by the citizens on Rocky Hill, a rugged eminence 500 feet high overlooking the city. This spot, provided by nature, is unequalled anywhere in Australia as a site for a soldiers` memorial. Situated as it is towering 80ft above the hill, the monument is acknowledged by architects and people of extensive travel to be the grandest of its kind in the world. The structure conforms with its surroundings, and symbolises the strength and endurance of the Australian soldiers. The Governor and party arrive at 12 noon, and the unveiling ceremony will take place at 3pm. ANZAC Day April 25 1924.